Hubbard Street Dance Chicago’s fall program, Space, In Perspective, will be exploring a lot of new ground, and quite literally. For forty years, the Company has been presenting dance concerts in theaters with choreography and performance on the stage (where it usually is), and an audience sitting where the audience usually sits for a dance concert — in the audience. Not this time. “As we embark upon our 40th anniversary season, we are looking to create a new audience experience of contemporary dance that is bold, adventurous, and forward thinking,” explains Glenn Edgerton, Hubbard Street’s Artistic Director. Space, In Perspective also features the full HSDC company of performers, all sixteen company members, and all sixteen dancers in the new Hubbard Street Professional Program, HSPro. Fortunately, some of them are friends of ours, so we thought we’d ask HSPro’s Melissa Panetta to give us an inside look into this remarkable creative adventure, and also to get her perspective on some other interesting questions. Melissa Panetta is originally from Montreal, a professional dancer and choreographer whose training covers a full spectrum of dance styles and disciplines. She knows the dance scenes in Montreal where she was born and where much of her family is, in London, Ontario where she began her training, in Toronto where she later moved and trained with The National Ballet of Canada, and in Vancouver, where she graduated from Simon Fraser University and then joined DezzaDance. In 2016 she joined Thodos Dance Chicago where, in her debut season, she performed the complex principle role of Helen Keller in Melissa Thodos and Anne Reinking’s story ballet A Light In the Dark — the story of Anne Sullivan and Helen Keller. As a performer, Panetta can drive an audience’s focus through a full length work, as in her delicate dance-and dramatic portrayal of Helen Keller, and she bring’s that same inspired precision to the ensemble, solo and partnered expressions of pure dance. Johnny Nevin: You came to Chicago from Toronto to join Thodos Dance Chicago, and when Thodos Dance transitioned to a project-based model, you joined Hubbard Street Pro. How do you find concert dance here compared to concert dance in Canada? Melissa Panetta: As a Canadian, living in multiple parts of the country has taught me a lot about dance in Canada. Being born in Montreal, completing my Bachelor of Fine Arts (majoring in dance and minoring in kinesiology) in Vancouver, and living in the Toronto area for the majority of my life, I have explored many different dance scenes throughout the years. I absolutely love being Canadian and the dance Canada has to offer! Though the dance industry has always been small, it has grown so much and continues to evolve. After graduating in 2016, I did move to the United States to pursue a professional career in dance. I was fortunate enough to work with Chicago based company Thodos Dance Chicago before they transitioned to a project based company. Now joining the Hubbard Street Professional Program and being in Chicago for over a year I have a better understanding of the dance scene here! The biggest difference I found was that there are just more concert dance companies in the United States compared to Canada. In my experience, not one is better than the other, however being immersed in both countries has given me a deeper perspective of dance as a whole! Johnny Nevin: Space, In Perspective is an unusual performance concept, and it includes both Hubbard Street Companies, so that the Hubbard Street Pro dancers are working side by side with the dancers from the main company. What has that been like? Melissa Panetta: It has been an absolute pleasure and honor to work with the main company for this project! They are all such incredible movers yet so humble. The fact that Hubbard Street Pro is directly integrated with the company on a daily basis is such an inspiring experience. The atmosphere feels like one big community rather than separate groups as we are dancing directly alongside each other for parts of the choreography. This project being the start of the HSPro Program not only was an incredible opportunity, but has really strengthened the bond between Hubbard Street dancers and HSPro dancers in such a special way, that I am beyond grateful for! Johnny Nevin: This is a very unusual concept in dance, with the audience apparently following the dancers into some really unusual performance spaces (like the lobbies, backstage, and even a loading dock). It’s always an interesting process to work with a guest choreographer, so what has it been like working with Peter Chu on this project? Melissa Panetta: This project is definitely a unique experience because the concept of the piece is not your typical performance. Glenn Edgerton, artistic director of Hubbard Street explained to us when we first began the project that he always wanted to transform the Harris Theatre, and with this year being the company’s 40th anniversary, he thought the timing couldn’t be better. Not only are we transforming the theatre, we are giving viewers a whole new experience. 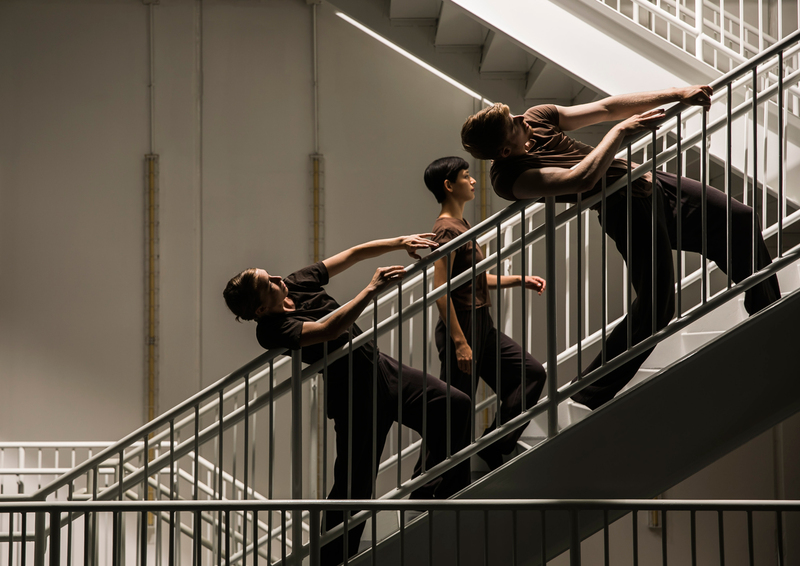 Audience members will get the opportunity to follow dancers around the whole facility including elevators, staircases, backstage, and the loading dock to name a few. The house will be closed the whole time and viewers will actually be “on stage” as part of the performance. As choreographer Peter Chu says, “its like a moving art gallery”. Working with Peter Chu on this project has been nothing but incredible! He is not only a kind hearted individual but really allows dancers to understand the vision behind the choreography. His patience and personal connection with each dancer really lets you understand the movement in a deeper way creating a full body experience. Johnny Nevin: The piece is set to a score by Djeff Houle, and we’ve even heard that Hubbard Street dancer David Schultz will be playing xylophone live on one of the tracks. So what’s the music like? Melissa Panetta: The music for this performance has a variety of different sounds. The beginning starts out more light hearted and uplifting with some familiar songs including “This Land is Your Land” and “Heart and Soul”. As the piece continues, we see a shift in music and yes company member David Schultz plays the xylophone on stage live! Its quite a magnificent sound! Johnny Nevin: Hubbard Street is such a widely recognized Company, what has been most striking to you so far in your experience there? Melissa Panetta: Though I have only been there a short time, Hubbard Street has been absolutely amazing so far! What is most striking to me is how welcoming and positive the atmosphere is. All the dancers and instructors are so incredible and are such an inspiration to work with. Even though there are so many different departments through Hubbard Street, there is a sense of community between everyone! The positive environment allows you to learn in a safe space while exploring your artistic freedom. I look forward to continuing my journey there! Hubbard Street Dance Chicago’s fall engagement, Space In Perspective, will be presented at Chicago’ Harris Theater of Music and Dance for seven performances: Thursday, Sept. 21 at 7:30pm; Friday, Sept. 22 at 7pm and 9pm; Saturday, Sept. 23 at 7pm and 9pm; Sunday, Sept. 24 at 2pm and 5pm. Audience capacity is strictly limited to 400 per performance. Tickets are available at hubbardstreetdance.com or by phone at 312-635- 3799. Discounted rates and add-on experiences are available for groups of 10 or more patrons; visit hubbardstreetdance.com/groups or call 312-850-9744 ext. 164 for more information. Tickets can also be obtained at the Harris Theater box office. So, where did we get those cool pictures from?